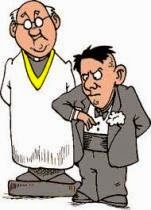 Today's wedding mass started in a slightly sour note - and it was because of the wedding mass previous to it. Apparently, the church assistants have been waiting for quite a while for the 2pm wedding entourage to leave the church. You see, typically we have 8pm, 10pm, 2pm and 3pm weddings in our parish. Well this time, there was a 4pm wedding as well. This is the wedding where I'm the commentator. As usual, I was there early for the 4pm wedding mass to prepare myself at the commentator's lectern. When I arrived, I saw some of sponsors, friends and the couple of the previous wedding still having their pictures taken. One mass assistant must have had it and approach me at the lectern. She said, "You look like a priest, so could you tell these people to leave?!" The other assistants were holding some linen of a different color from the 2pm wedding. I suppose the 4pm wedding had a different color motiff. I fully understood and sympathized with the mass assistants. And so with a serious tone, I spoke on the microphone, "Please, the wedding mass has finished. There is a scheduled 4pm wedding mass that will start in a few minutes." The groom was still enjoying himself, laughing so loudly with his friends like they were in a party. He glanced me a bit with a hand gesture that seemed to say "Be cool bro, we'll go when we'll go." The mass assistant told me that the couple had been saying "This will be the last (shot)" a few times already but they still refuse to leave. With a firmer voice, I said "Time's up! The assistants will still need to put on the linen and other decoration for the next wedding!" It was only then when the wedding couple motioned their friends and the wedding photographer to pack up and go. But the pictorial continued, this time at the church's side doors and main entrance. This though, did not disturb the setting up for the next wedding mass that was about to begin. At around this time some of the 4pm entourage of the next wedding have started coming in and were already mixing in with the 2pm folks still at the church's entrance. There was some confusion and it was not a pretty sight. Why does this happen though? Why does a wedding end so late that it overlaps with the next wedding - much to the inconvenience of the next wedding? This is on top of the 2 hours that is already allotted for each wedding. It is not a common occurrence, but it happens. In the weddings that I've attended, the groom is always on time, if not earlier. The bride is sometimes the last to come into the church grounds and many think it is customary. However, when someone "important" in the entourage is unacceptably late, you're treading on dangerous grounds. Even if the entourage proceeds without him/her, time has been lost already due to the long wait. Heavy traffic is oftentimes blamed when someone is late, although there have been times when somebody got lost looking for the church. Let's say someone "from the church" is late. This could mean the priest, the church choir, or the commentator. This is rare, but it does happen. It happened to me once when I accidentally skipped a wedding mass as commentator and I apologized for it. Traffic? It isn't an issue for me as I ride a bike to church. This also happens even in the regular Sunday masses. Thankfully, it is not very common. But in those rare times, the officiating priest finds a sweet spot in his homily, gets into a groove, wows the audience, and somehow forgets the time. Ah, this is sometimes the most abused part - taking pictures like there's no tomorrow. At this point, the wedding mass is over, the couple's parents and sponsors are glad it's over and everyone is in a good mood. So, it's picture time! The wedding couple typically spends much on the photography package for their wedding memories. With film rolls out of vogue and that USB or external drive practically packing unlimited number of wedding photos, the sky's the limit! If the photography coordinator isn't organized enough, they may spend too much time calling folks to come over for the photo-shoot. Also, many couples seem to think that, "Hey, we've paid this church for OUR time!" Well, you're right. Just remember, "YOUR" time is less than 2 hours only. Be considerate if there's another wedding mass following yours.